Models are mounted with a facebow in two stages: The maxillary model is first inserted, then the mandibular model is mounted over a centric record. To transfer the maxillary model position, telescopic legs can be attached to the facebow to set up the arch precisely in relation to the hinge-axis points of the articulator. The earpieces are placed onto the condylar casing, and the length of the telescopic legs is adjusted to align the facebow with the top part of the articulator. 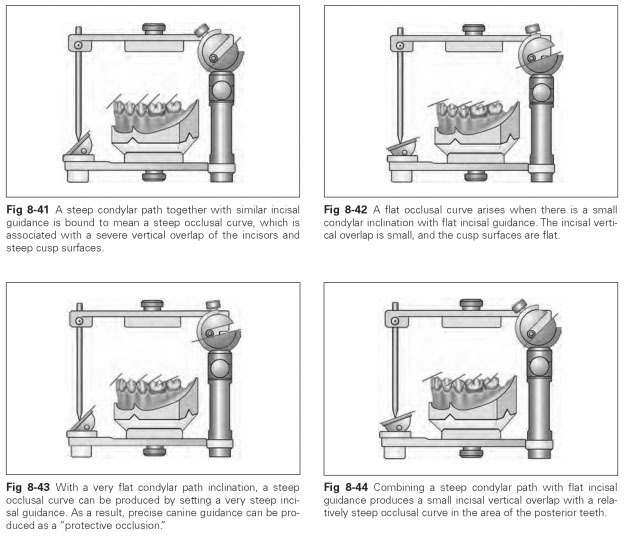 Depending on the reference plane chosen, the orientation of the occlusal plane is variably steep. The position of the maxillary model can also be transferred with a transfer jig or transfer stand. With some articulators, this accessory can be inserted instead of the incisal guide plate in a firmly defined position and is designed to receive the joint support. The joint support is clamped into the transfer jig with the bite fork and is then in the correct position inside the articulator. The face-bow stays with the dentist for further use. Once the bite fork (whether with a facebow or a transfer jig) is set up in the articulator, the maxillary model fits into the bite fork. So that the bite fork is not displaced by the weight of the model, it has to be supported from below, either with a plaster block or a so-called forked bracket. If the maxillary model is fixed in such a way, it is set in plaster in the maxillary model holder. Then the mandibular model can be combined with the maxillary model by means of a centric record and also plastered in place (Fig 8-37). To minimize error, the models are mounted by the split-model method (magnetic base system) (Fig 8-38). To do this, the model bases are split into a primary and a secondary base and fitted with wedge-shaped retention depressions and a magnetic connector. 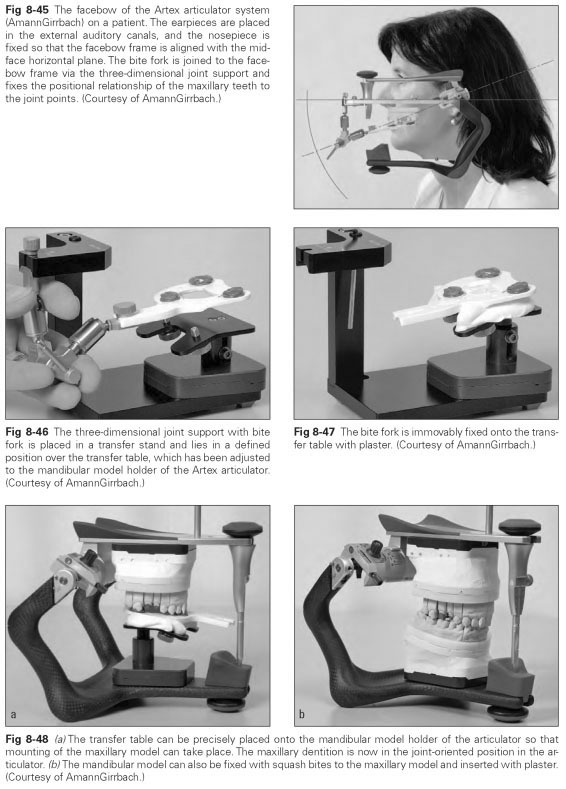 The split-model is used to check the correct occlusal position with the aid of several centric records (Fig 8-39). Both split-models are mounted in the articulator in two stages, as described above. Then the retention magnet in the maxillary model is temporarily removed, and a second centric record is placed between the rows of teeth. When the upper arm of the articulator is closed, the slightest discrepancies between the masticatory organ and the articulator become noticeable from the gap between the maxillary model and base. This check must be repeated with different centric records. When there are discrepancies, the mandibular model is removed and reset with the correct record. As well as this check function, the split-model method allows the model to be rapidly removed from and inserted into the articulator. The joint values are set either individually or based on average values, depending on the options offered by the articulator used. In the average-value method, the joint values must be selected in relation to the reference plane that was used for mounting the models. If the hinge-axis orbital plane was used, the occlusal plane is inclined at a relatively steep angle; if the midface horizontal plane was adopted, the occlusal plane is gently inclined; with the Camper plane, the occlusal plane is horizontal. The inclinations of the incisal guide plate should be selected on the basis of these values. The entirety of the occlusal surfaces, which together with the articular surfaces form the mechanical guidance of the mandible, is reduced in an articulator to the incisal guide pin that rests on an incisal guide plate. This incisal guide plate represents the whole of the occlusal field. Thus, it is clear that the inclination of the incisal guide plate has the same influence on shaping the inclinations of the occlusal surfaces as it does on shaping the inclination of the condylar paths. If anterior guidance is very steep, precise canine guidance can be produced. The vertical incisal guide pin must remain in contact with the guide plate during a whole movement stroke; if the tracing stylus lifts up, there is an occlusal disturbance present. In the case of complete dentures, the aim should be all-over sliding contact of the teeth in lateral and protrusive movements to support stability, whereas contacts on the nonworking side are undesirable with a fixed denture. 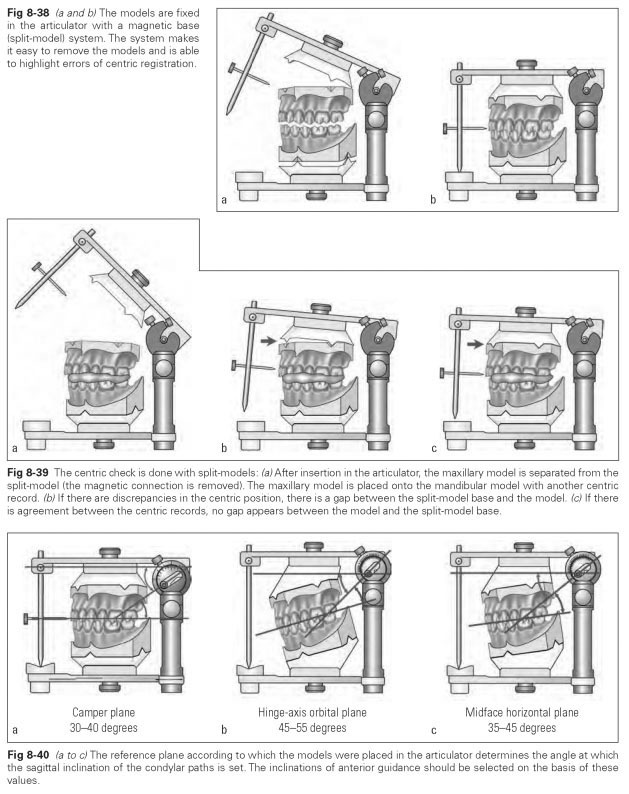 Figures 8-41 to 8-48 illustrate various considerations for mounting models in the articulator.